Government of Zimbabwe is strengthening efforts to attract a substantial share of the Chinese US$60 billion investment fund under the Forum on China-African Cooperation (FOCAC) initiative amid lackluster investment flows into the country, 263Chat has established. Despite concerted efforts to lure global investment since President Emmerson Mnangagwa came into office, there has been a rather uninspiring response particularly from the Western nations, prompting government to look east. Briefing journalists at Munhumutapa offices this morning on the meeting between vice-President Costantino Chiwenga and Chinese Ambassador to Zimbabwe, Guo Shaochun, Foreign Affairs and International Trade Minister, Sibusiso Moyo said Zimbabwe is targeting a substantial share of Chinese US$ 60 billion investment in Africa. “Economic corporation in particular and therefore these are the areas of focus that his excellency was briefing the vice president and we think that our relationship which obviously has been raised to the comprehensive partnership is now going to bear fruit as we continue,”said Moyo. Ambassador Shaochun said Chinese government will also donate towards the victims of cyclone Idai to the tune of US$ 40 million. “We going to dig 500 boreholes and provide 165 tonnes of rice to the Zimbabwean government, so totally the support, the assistance will be over us$ 30 million, as true friends and true brothers we will do our best to support Zimbabwe,” said Ambassador Shaochun. 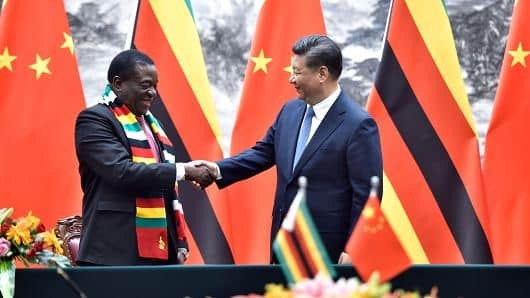 China has become the continent’s largest investor in recent years but Zimbabwe has not harnessed much from it despite having strong ties with the Asian giant. China-Africa relations have been under scrutiny with analysts highlighting that much of Chinese investments in the region has been largely skewed towards extraction of natural resources at the expense of other sectors with a greater impact to African citizenry. But for Zimbabwe, many of the Chinese projects in the past have been clouded by ambiguity, a case that has left many observers skeptical of its benefits. However, launching the US$ 60 billion fund last year, Chinese President Xi Jinping warned against funds going toward “vanity projects”.